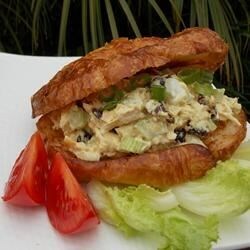 "An easy tuna sandwich with a crunch and a twist." Mix tuna, mayonnaise, peanuts, raisins, and celery in a bowl. Season with curry powder, salt, black pepper, sugar, garlic powder, and cayenne pepper. Stir in onion and green onions. Serve on sliced bread. Top with tomato and cheese and grill until the cheese melts for another serving option. I reduced the celery by half. I used sour cream instead of mayonnaise and doubled it. It was still really bland and dry with the dressing doubled. This needed about two tablespoons of mayonnaise - I used 1 tsp of curry powder and it was more than enough. The curry kind of masks the other flavors. it was very good! i didnt have peanuts so i used almonds, and i squirted lemon on it also. Omitted peanuts as I didn't have any and substituted sour cream for the mayo and doubled the amount. Was a great basis for my subtle changes. Will definitely make it again.